This dish is courtesy of some fine fellows down at the Fallbrook Mushroom Company, who periodically drop a few (large) boxes of shiitake mushrooms off at a Bank of America down in Temecula. I get to take a load home, and experiment! Shiitake mushrooms are quite different to regular mushrooms in my mind. Although they taste fairly similar, I don’t think you can rinse them like normal mushrooms, and the stems are really chewy. In this dish, I removed the stalks, but I didn’t throw them away, as they are wonderful in veggie burgers! 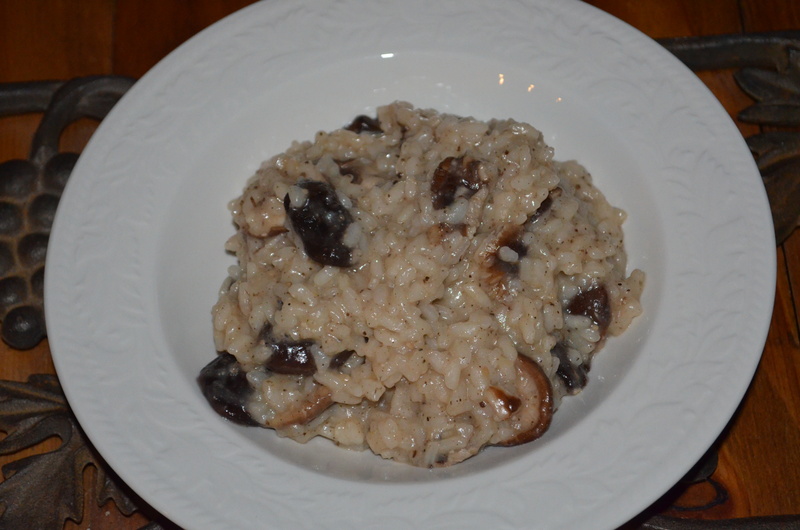 This risotto is an uncomplicated, richly mushroom-y supper. A really personal pleasure. Prepare the mushrooms by wiping any dust/dirt off them with a paper towel. Remove the stems. If the mushrooms are fairly small, leave them whole, otherwise, quarter them. Melt the margarine in a medium saucepan. Add the mushrooms, and fry for about 5 minutes until softened. In a second pan, warm 2 1/2 cups of water, with the mushroom powder, salt, pepper, and wine. Remove the mushrooms from the pan, and put to one side. In the mushroom pan, melt the second tbsp of margarine; add the rice, and stir frequently until the rice is all coated with fat and turning translucent. Add about 1 cup of the warmed water mixture to the rice, and stir frequently until the water is almost completely absorbed. Keep adding the warmed water mixture 1/2 cup at a time, stirring frequently, and allowing each addition to be almost completely absorbed before adding the next. Repeat until all the warmed water mixture has been added. Check the rice is cooked; if necessary, add another 1/2 cup water and continue cooking. Stir in the cooked mushrooms. Serve with optional (and highly recommended) black or white truffle in olive oil garnish.